an additional date for teams participating in Post Season Play (City Finals/Slush Cup) will be announced. For U5 to U9, the players’ jerseys are sponsored and therefore a keepsake for the players. All other equipment must be returned on equipment return date. For the U11 to U17 Community teams, Coaches are to collect their players’ jerseys at the end of their season preferably at the team’s last game of the season. Please launder the jerseys and return them clean and dry with their team equipment. All team equipment is to be returned to the equipment warehouse on one of the applicable return date. Upon review of the returned players jerseys, if the players jerseys are in good standing the player’s jersey cheque deposit will be shredded. If a jersey is destroyed, not returned or lost the applicable player’s jersey deposit will be cashed. If Coaches cannot make the equipment return dates they are expected to make alternate arrangements during the season with one of their coaching staff or a parent on their team to return their team’s equipment on one of the dates listed above. Team equipment and/or players’ jerseys are not to be returned to the office. The MWSA Equipment Warehouse is located between 71st and 72nd Avenue & 99 Street, next to Russel Metals. The warehouse faces 99 Street and has a large mural/painting of Joey Moss on it. Soccer flags mark the entrance door. 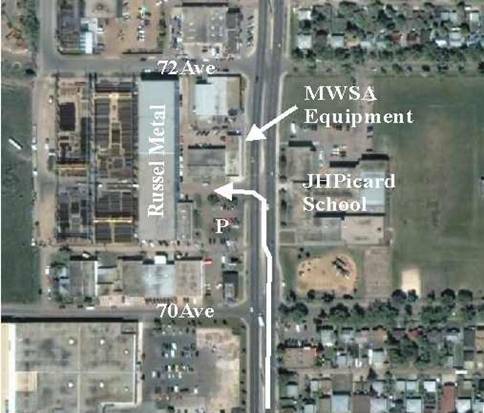 Parking is available at the Russel Metals parking lot, on the west side of 99 Street on 71 Avenue. All equipment handouts and returns occur at this location.